Hello, my name is Shannon Blackford, and I love all things home and family. Creating a warm and loving home is what feeds my soul. I’m a housewife and stay at home mother from Mustang, Oklahoma. I have been blessed with a wonderful husband and three beautiful children. Recently, with the encouragement of my husband, I completed my certification in interior redesign and home staging from Transformations Staging and Redesign School in Jacksonville, Florida. I’m now launching my interior redesign and home staging business along with a blog called Belle Bleu Interiors. It is my utmost intention to inspire all who read my blog. 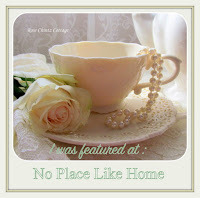 I will be showcasing decorating tips, organization solutions, tablescapes, recipes, party ideas, and gardening tips. Our tastes and styles may not be the same, but it is my hope that you can take an idea or something I have shown and use it to suit your taste and style. My wish is to inspire you to create a warm, comfortable, and happy home no matter where you live.